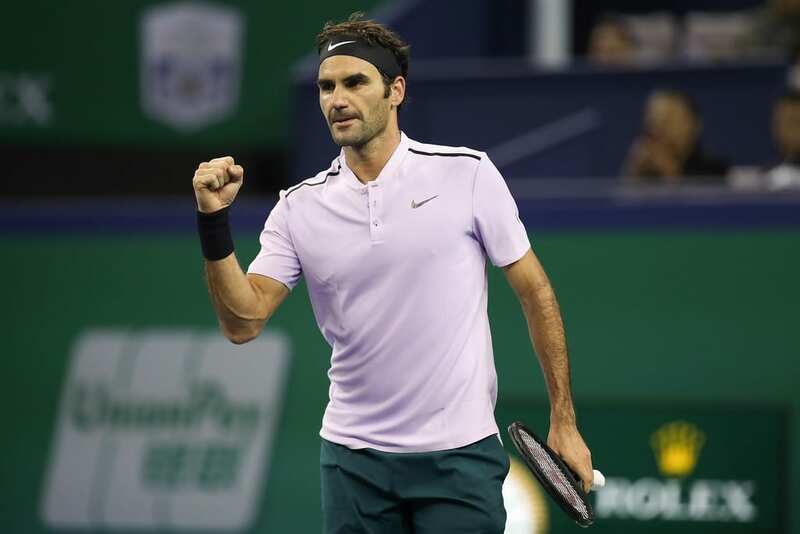 Roger Federer is into the last four in Shanghai after seeing off Richard Gasquet 7-5, 6-4 in 1 hour and 18 minutes to set up a tie against his US Open conqueror Juan Martin Del Potro. I'd billed the encounter as a foregone conclusion pre-match but Gasquet put in a spirited performance, moving better than I've seen him of late and playing further up the court to give Roger a stern examination. Federer won the toss and elected to receive. A good play against a guy with an average serve but Gasquet came out of the blocks nicely holding to 15. 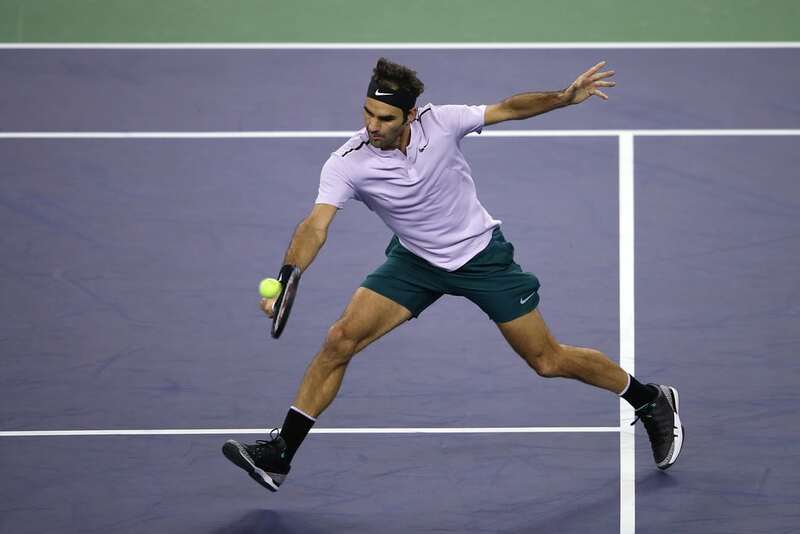 Roger quickly leveled to love but in game six it was the Frenchman who fashioned the first break point, encouraged by a quality get earlier in the game. Fortunately, Roger saved it to level at 3-3. More offense from the Frenchman had Roger under pressure in his next two service games but he held firm to level at 5 games all. From there he was able to seize the set, playing a dreamy lob for 0-15, winning an extended rally at 15-15 and then breaking for 6-5. He went on to serve it out to 30. With Gasquet no doubt disappointed to drop the opener, he got off to a terrible start in the second, dropping serve to love. I thought the match was done and dusted but Gasquet hit back, breaking straight back to level at 1-1. The Frenchman then showed some mettle by saving two break points in game five but in his next service hold a lucky net cord at 30-40 gave Fed the break and he was able to serve his way over the line 6-4 in the second. Another solid display from Fed here to make the semi-finals. Not quite as dominant as we saw against Dolgopolov but that's because Gasquet offered up plenty of resistance and some quality shotmaking of his own to keep Roger honest. All the numbers make decent reading again with the first serve up at 79% and winning 18 of 23 at net. Usually, Gasquet is content to just sit deep but he went after his shots today and had quite a few chances in the first set to get in front. After faltering at 5 games all though, I thought Fed was the better player as despite never going away Gasquet looked a little tired towards the end. As did Fed to be honest but he has the game to bank those free points when needs them on serve to get himself over the line. So another good win and another fun match. This court seems to offer a little bit of something for everyone and like the Dolog match this one featured some fast paced hitting, net forays, plenty slice, plenty spin and it's just been fun to watch. Next up is Del Potro who defeated Troicki in a tough three setter. Del Po has gone the distance three times already this week and took a tumble today in the third set with his left wrist taking the brunt of it. The Argentine went for an MRI scan after press and has a wrist contusion. So I guess there is a chance he might withdraw, he'll decide tomorrow if he steps on court. Should they play I'm picking Federer to win. The US Open was a big win for Del Po but I'm confident Fed is playing 20 to 25% better than he was in New York and should be able to take this one and move into the final. What did you guys think? Will Del Po play the semi? Good win here from the Fedmeister. Gasquet played some quality stuff outside of his usual mould and provided a stern test ahead for the Swiss. I think Delpo will play – the tumble didn’t look that bad, did it? But Fed should win this time. And another Fedal final on Sunday would be great! Yeah was a weird fall. Hearing just a bruise so prob not a huge deal. Slices for him! Looks like it might be safe to come out from behind the couch and watch Fed play matches live again but I’m a bit nervous about Nadal if he gets there. Fed seems to be playing “safe” by standing well behind the baseline a lot. No SABRs for a long time either. I do like his outfit. I wonder how much say he has in designing the outfits and colours. Not sure I’m seeing the magic or the special shots we used to get, what do others think? Are we expecting too much? I agree, some beautiful shots but not really convincing in the longer rallies especially. Against Nadal (and Delpotro) that is slightly worrying. Tbh I thought he has played very aggressive this week, not safe at all. Totally up on the baseline. I think Nadal slight favourite by virtue of his form since the US Open should they meet. Maybe Del Po has a say first. Nadal has not played any one in the top 20 in his last 15 matches. Also, he played Delpo in the US Open after Delpo was worn out by all those other previous matches, including the 4 setter against Fed. Nadal with confidence always tough to beat. Dimitrov not really got the intent to beat Rafa though, look at AO, all matches since following similar pattern. I saw the match on tv live and RF played some great shots – his backhand was superb, he hit more BH winners than Gasquet! On the otherhand, in every game he had a couple of bad shots, shanks, missed lines, etc. I think he needs to tighten up his game to have chance against Delpo. Delpo has been playing very well in Sganghai, especially against Zverev and against Troicki. But his fall looked bad and he was in a lot of pain. I thought he would retire mid-match today, but continued and win the match. Of course but it’s a quick court and he’s taking it early, errors are part and parcel. Still great entertainment and brilliance! – Not the least from Gasquet! 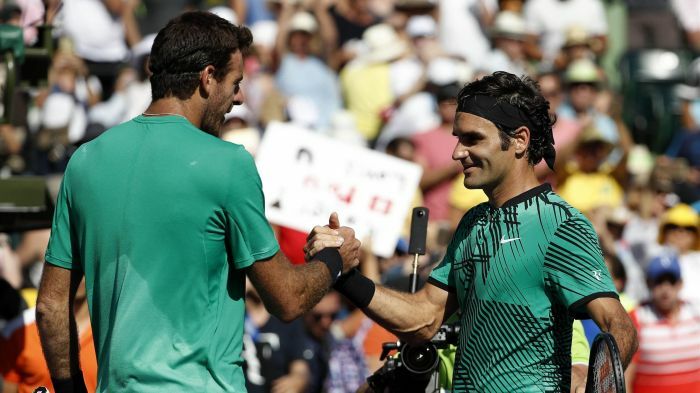 Delpo’s forehand is nasty, but Roger’s too. I think he enjoys the fast court a lot, and will have a more than decent chance vs Delpo, whom I guess will play. No stars to day??? No one-word character?? I miss it! Del Potro’s forehand is ugly. Ugly forehand. Sit. Stay. Bah. Where were we? Ah, today’s match. Yeah, much tighter than expected but credit to Gasquet. I liked to see Roger slapping his backhand whenever I shouted “slap that darned ball now”. The most honest thing I’ve heard in a while, about the Del Po forehand. Might be the ugliest shot in tennis. Oh no…wait, Gulbis comes to mind. The grunt is also ugly. Just overall ugly game and pretentious mannerisms. He is a Nadal in sheep’s clothing. Hope he gets put away by Fed. Fed has a modified eastern and it doesn’t look weird. There’s just something about that forehand that I hate. Just hacks it, with the height and leverage he has. No one thinks Cilic might beat Nadal? I foresee Cilic beating himself. He’s damn good at it. Yeah, not sure how Cilic beats Nadal especially with Nadal getting more and more conditioned to fast courts. And Shanghai, from what I’m seeing in highlights looks pretty darn fast. Feels like AO. Good for Fed. I must admit that I was a bit twitchy watching the scores on this one, because it was tighter than I’d expected. ATP website showed Roger as getting no aces in set 1 – really? For a moment, I wondered if his back was giving him trouble, but his first service percentage was 80, so it didn’t seem too likely. I do hope Gasquet’s game is back on an upward trajectory again. As for Delpo, I do hope he’s not too badly hurt. He doesn’t need any more injuries. ATP Stats been all over place this week. Were you in the Protennislive app thing? No, just on the normal stats you access from the ATP livescores page. Second time I’ve tried, second time all the entries were showing as zero. Poor show, ATP! Am I the only one who thinks that many of Rogers UFE’s were jaw-droppingly bad? Gasquet had a ton of high bouncing topspin on his balls, I thought. There were a few where they looked to be bounding way above Fed’s shoulder..Hopefully Fed hasn’t forgotten about stepping in and taking the ball early like he did in AusOpen. High risk tennis on faster courts it happens, he played Dolgo the day before, so little rhythm maybe and loose shots. Just be happy he’s out there and doing well He has the stands full of super emotional fans bedecked in RF gear, putting the huge weight of expectation on, likely a few shots are duffed under the pressure to please them as us but yes it’s getting serious so hopefully he builds on USO Delpo experience, on a more suitable to Fed court speed. Delpo sounds like it’s just a bruise, maybe he will pull up more sore & give a walkover but I suspect he plays so often with pain he will soldier on. Fed for the win in 2 as he tightens his game up at the pointy end of the tourney, but it might be uncomfortable as being Team 8 Fed knows more about Delpo health status than he did with Marin at Wimbledon! Great write ups Jonathan and speedy like the Shanghai courts, thankyou. *please them and us oops! I like Nadal better than Delpo. Don’t like sheep’s clothing! Del Potro needs to learn how to fall properly. Far too clumsy. He did have bad knees, proppy maybe and they buckle at times! Youpi !! Another Federer-Nadal final… at breakfast tile on a sunny Sunday ! 196 days without a Fedal confrontation. We missed it… THANK YOU, champions !